They belongs to musical royal family PATIALA GHARANA. 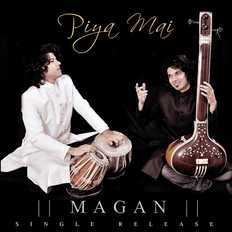 They have been representing India, across the world, The tedious session of Riyaz and phenomenal creativity chiseled the voices that shot Magan into the lime light. The journey is so far is full of learning. The swooning swarm could not stop grinning while these young boys basked in the glory of a single concert. They came, performed and conquered many hearts! A rare performance indeed by the band in a live concert. The band is a vital part of us but our classical base and training is more important.”The band is simple but it is the lyrics and verses that lift the tone and tempo — sometimes to incredible levels where the Sufi / Fusion is mind-boggling. Though the lead and base guitars dictate the music, it is percussion — the rolling beat of the drums — that provides the band with its own inimitable brand.